Romantic love never grows old. It's a theme in classic literature, a thread through every Shakespearean play, and the storyline of countless Hollywood movies. But every writer, poet, and storyteller is only retelling a story already told. Romance originated with God. It is one of His amazing creations. Even before the world broke with sin, the first man's heart longed for the sweet romantic love of a bride. And God made him one. Even though earthly romance will always be imperfect, God transforms us with abundant grace and gospel hope as we live life alongside our spouse. 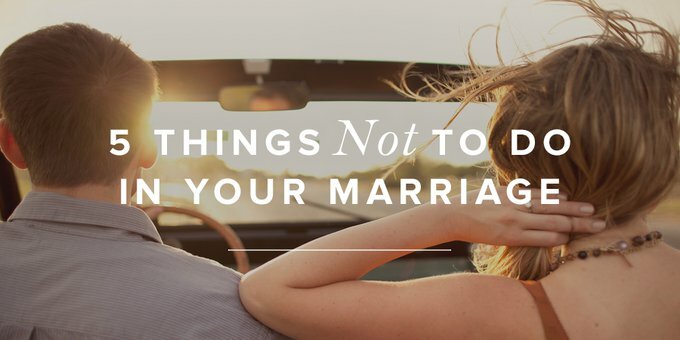 As we navigate the joys and the struggles of the marriage relationship, here are five things not to do. 1. Don't delay repentance and forgiveness. Sometimes our instinct is to stay mad, stay cold, or stay distant just a little bit longer when we've been sinned against. Even when we're approached in sincere repentance, we feel this fleshly instinct to cling to our anger. Don't do this! A response of delayed forgiveness can often be more destructive than the initial sin. We should forgive quickly and completely. Along with this, when we've been the one who has sinned against our spouse, don't delay asking for forgiveness. Again, sometimes we sinfully want to assert ourselves or punish our spouse by staying distant just a little bit longer. But coldness is no way to love someone. When we first feel the warm inclination to repent, we should immediately go to the one we've hurt. This might sound strange, but some of the sweetest moments in my marriage have been when I've walked over to Justin after I've sinned against him and, vulnerable, with tears in my eyes, asked his forgiveness and told him that I loved him. It's a taste of grace to repent and to be wrapped in the loving arms of forgiveness. 2. Don't assume the worst. In an average healthy Christian marriage, the husband and wife genuinely desire the other's good. My husband loves me, pours himself out for me, and would do anything for my good. And yet there are times when we're disagreeing or in moments of conflict and tension that I forget who he is. Our spouse is for us, and they desire what is best for us. In moments of conflict, Justin will occasionally remind me, "Hey, Elisha, remember that we're on the same team here, sweetheart." It's simple but helpful. In a healthy marriage, we have every reason to assume the best about our spouse—their motives and their heart—and yet our default setting during conflict can be to assume the worst about them. A husband and a wife are on the same team. We should believe the best and give each other the benefit of the doubt. 3. Don't focus on changing your spouse. Each one of us has ways we need to grow and change. Every Christian husband and every Christian wife is a work in progress. We should want change. We should want growth. And in the right sense, we should even want our spouse to change and grow in Christlikeness. But here's the thing: Our primary focus of change and growth and putting sin to death should be in ourselves, not in our spouse. 4. Don't be overly sensitive. Some of us have tender, sensitive hearts, and we're easily hurt and easily empathetic. I'm one of these women, and I've seen God use this quality for both good and bad in my marriage. There can be a sweetness and compassion that flows out of a sensitive heart that can help us love our husband well. But when we're overly sensitive, we're too easily hurt by things that never should have hurt us in the first place. If you're overly sensitive, learn to identify when you're being too sensitive and when you can just laugh something off. As I've grown in this, I've learned that it actually is so much easier to smile than be offended. Not taking everything to heart and learning to just let things go at the right time can be incredibly helpful. Even the best marriages go through seasons that are not always easy, where it takes real effort to love one another, where the road seems full of ruts, bumps, and potholes. This is one of the truths that it is so important for newly married couples to know ahead of time so they don't lose hope when they enter a difficult season. Just as there is an ebb and flow to life, so there is in marriage. There will be seasons where loving one another is effortless, and there will be other seasons where loving one another is a commitment that requires effort. Here's the thing: It's honestly okay for marriage to be hard sometimes. Almost everything in life that has lasting value is hard at one point or another. Stay committed to Christ, stay committed to your spouse, and watch as God brings you safely through that season. It's when we have the vantage point of looking back at the tough times that we see how our faith was refined and how our love for our spouse is stronger, deeper, and safer than we ever imagined possible. If we're Christians, we believe the hopeful truth that the gospel is transforming our marriage, God is at work in us, and God is at work in our spouse. In the sweet seasons, we rejoice; in the difficult ones, there is still every reason to have hope.